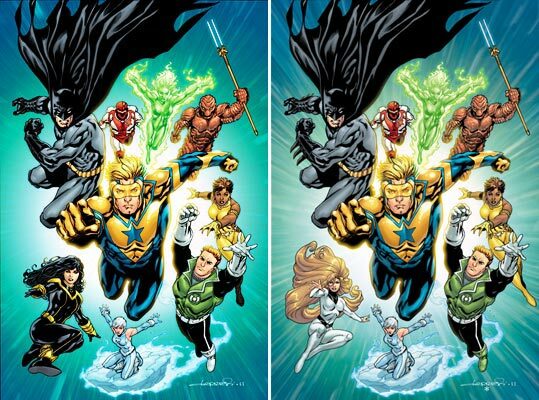 Via Twitter.com, Dan Jurgens finally has confirmed the identity of the mysterious woman we saw on the originally solicited cover to the 2012 New 52 relaunch of the Justice League International #1. Alexandra Gianopoulos was introduced in Booster Gold #45 when Booster quite literally fell into her bed in the "Flashpoint" timeline. Her power was the ability to "borrow" the power of anyone she touched, similar to Rogue of the X-Men. 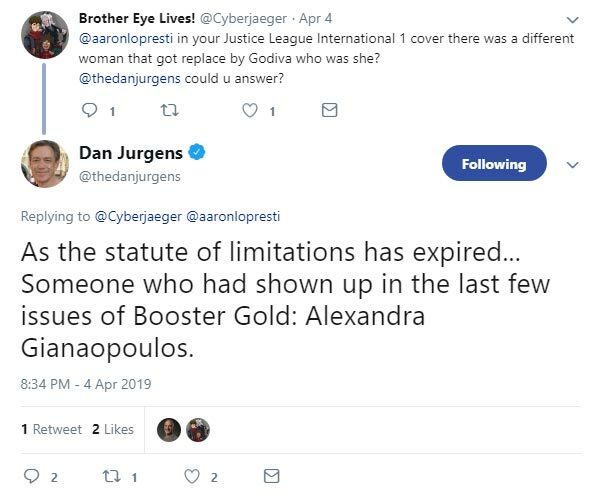 Despite also appearing on the published cover of Justice League International #5, Gianopoulos has never actually made the transition from the Flashpoint timeline to mainstream DCnU continuity. Thanks to @Cyberjaeger for asking the question that finally resolved this longstanding mystery. One mystery im glad solved. Hopefully Jurgens can pick up that thread sometime in the future. Sadly all of Boosters supporting cast has been in limbo. I thought it was settled long ago that she was Alexandra. If Booster Gold stole four super powers and then stole six more, how many super powers has he taken in all? If you had nine dollars and then spent eight dollars on Booster Gold comics, how many dollars do you have left?